I was online shopping a few weeks ago and came across this unique shirt on the Rainbow website. 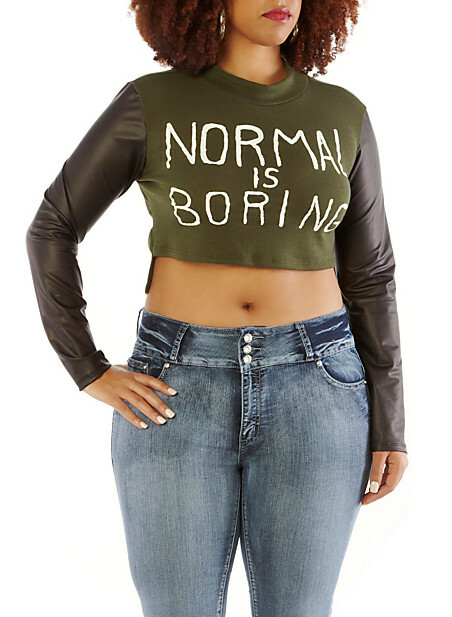 It is a crop-top with faux-leather sleeves with the writing “Normal Is Boring” across the front. That instantly caught my attention because that’s how I often describe my fashion style, nothing boring or ordinary. Many fashionistas don’t like to follow trends, switch-up styles or take chances and I choose to do all of the above from time to time. Being a full size 18/20 many may think twice about baring their midriff but not I. I guess that’s where the extra fashionable confidence comes in from “Not being boring with your own personal style”. Now I do have my days where I second guess my fashion choices for a split second, but I just tell myself to keep it moving and today was one of those days. I paired the shirt with a liquid skater skirt ($29, Sizes 1X-3X) from Chic and Curvy Boutique and these Paris Skyline Tights ($14.50) from Asos. I had been waiting for the perfect skirt to wear with the tights to show off the design on them and figured a skater skirt would do the trick. But the tights run small so I was uncomfortable in them and actually ended up taking them off right after the pics. Plus the skyline doesn’t show up too good while on. But maybe that’s just on me. Since today was a 75 degree day I decided on my open-toe booties to complete the outfit and bold earrings, also from Rainbow.